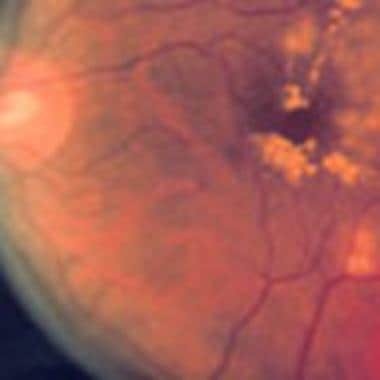 Panretinal photocoagulation in venous occlusive eye diseases. Image courtesy of National Eye Institute, National Institutes of Health. Focal or grid photocoagulation in macular edema from diabetes or branch vein occlusion. Image courtesy of National Eye Institute, National Institutes of Health. Patients require anesthesia for the procedure. Most patients undergo retinal laser procedures under topical anesthesia such as proparacaine eye drops. Other patients will require subconjunctival, peribulbar, or retrobulbar injections of lidocaine. Monitored anesthesia care or general anesthesia is usually used for premature infants (with retinopathy of prematurity), children, and patients with problems in compliance. Slit lamp examination. Image courtesy of National Eye Institute, National Institutes of Health. Laser indirect ophthalmoscopy (LIO). Image courtesy of National Eye Institute, National Institutes of Health. Laser can also be delivered internally (inside the eye), usually during vitrectomy procedures. An endolaser probe is introduced into the vitreous cavity, and laser is fired directly to the retina. The procedure is viewed using vitrectomy lens under an operating microscope. When using the slit lamp delivery system, the procedure is performed with the patient in a sitting position. 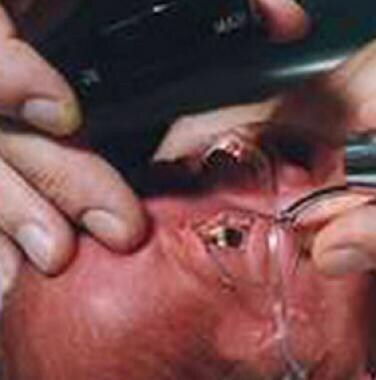 With the endolaser and transscleral delivery systems, the patient is supine. With the LIO, the patient may be sitting or supine. Proper laser protection goggles are required for all staff assisting the procedure. The laser safety filter (specific for each wavelength of laser) on the delivery system should always be activated upon performing the procedure. The patient should be well positioned and instructed prior to the procedure. Retrobulbar block or general anesthesia may be done for compliance problems. The procedure should be performed or supervised by an experienced ophthalmologist to avoid technical errors resulting in complications from the procedure. When using the slit lamp delivery system, a slit lamp contact lens is used to focus a beam of laser light onto the retina. 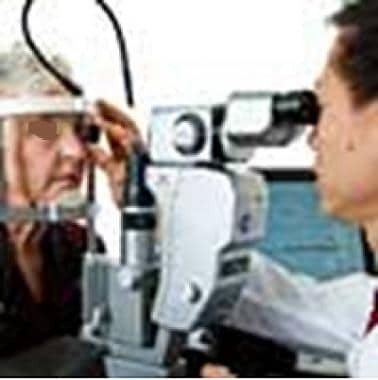 With the indirect ophthalmoscope system, an indirect lens is used to focus the laser light onto the retina. With the endolaser, a laser probe is introduced into the vitreous cavity (usually during vitrectomy surgery) and the laser light is directly applied to the retina. Glickman RD. Phototoxicity to the retina: mechanisms of damage. Int J Toxicol. 2002 Nov-Dec. 21(6):473-90. [Medline]. Photocoagulation treatment of proliferative diabetic retinopathy: the second report of diabetic retinopathy study findings. Ophthalmology. 1978 Jan. 85(1):82-106. [Medline]. Okamoto M, Matsuura T, Ogata N. EFFECTS OF PANRETINAL PHOTOCOAGULATION ON CHOROIDAL THICKNESS AND CHOROIDAL BLOOD FLOW IN PATIENTS WITH SEVERE NONPROLIFERATIVE DIABETIC RETINOPATHY. Retina. 2015 Oct 7. [Medline]. Ogura S, Yasukawa T, Kato A, Kuwayama S, Hamada S, Hirano Y, et al. Indocyanine Green Angiography-Guided Focal Laser Photocoagulation for Diabetic Macular Edema. Ophthalmologica. 2015 Sep 23. [Medline]. Ip M, Puliafito CA. Laser Photocoagulation. Yanoff, Duker JS. Ophthalmology. 3rd. Elsevier Health Sciences; 2008. 522-3. Parodi MB, Bandello F. Branch retinal vein occlusion: classification and treatment. Ophthalmologica. 2009. 223(5):298-305. [Medline]. Leaver P, Williams C. Argon laser photocoagulation in the treatment of central serous retinopathy. Br J Ophthalmol. 1979 Oct. 63(10):674-7. [Medline]. [Full Text]. Salvin JH, Lehman SS, Jin J, Hendricks DH. 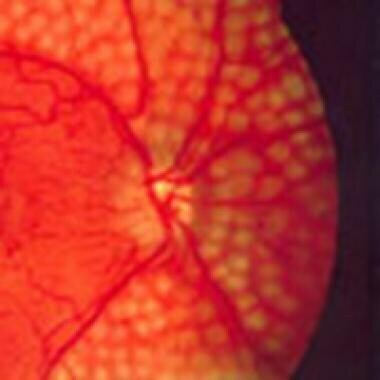 Update on retinopathy of prematurity: treatment options and outcomes. Curr Opin Ophthalmol. 2010 Sep. 21(5):329-34. [Medline]. Stoffelns BM, Schoepfer K, Vetter J, Mirshahi A, Elflein H. [Long-Term Follow-Up 10 Years after Transpupillary Thermotherapy (TTT) for Small, Posterior Located Malignant Melanomas of the Choroid.]. Klin Monbl Augenheilkd. 2011 Apr. 228(4):277-283. [Medline]. Becker BC, MacLachlan RA, Lobes LA Jr, Riviere CN. Semiautomated intraocular laser surgery using handheld instruments. Lasers Surg Med. 2010 Mar. 42(3):264-73. [Medline]. Zhou C, Qiu Q. 360° versus localized demarcation laser photocoagulation for macular-sparing retinal detachment in silicone oil-filled eyes with undetected breaks: A retrospective, comparative, interventional study. Lasers Surg Med. 2015 Oct 6. [Medline]. Kretz FT, Beger I, Koch F, Nowomiejska K, Auffarth GU, Koss MJ. Randomized Clinical Trial to Compare Micropulse Photocoagulation Versus Half-dose Verteporfin Photodynamic Therapy in the Treatment of Central Serous Chorioretinopathy. Ophthalmic Surg Lasers Imaging Retina. 2015 Sep 1. 46 (8):837-43. [Medline]. Mizuno K. Binocular indirect argon laser photocoagulator. Br J Ophthalmol. 1981 Jun. 65(6):425-8. [Medline]. Gangwani R, Liu DT, Congdon N, Lam PT, Lee VY, Yuen NS. Effectiveness of diode laser trans-scleral cyclophotocoagulation in patients following silicone oil-induced ocular hypertension in Chinese eyes. Indian J Ophthalmol. 2011 Jan-Feb. 59(1):64-6. [Medline]. Blumenkranz MS, Yellachich D, Andersen DE, et al. Semiautomated patterned scanning laser for retinal photocoagulation. Retina. 2006 Mar. 26(3):370-6. [Medline]. Yu AK, Merrill KD, Truong SN, Forward KM, Morse LS, Telander DG. The comparative histologic effects of subthreshold 532- and 810-nm diode micropulse laser on the retina. Invest Ophthalmol Vis Sci. 2013 Mar 1. 54 (3):2216-24. [Medline]. Fong DS, Girach A, Boney A. Visual side effects of successful scatter laser photocoagulation surgery for proliferative diabetic retinopathy: a literature review. Retina. 2007 Sep. 27(7):816-24. [Medline]. Henricsson M, Heijl A. The effect of panretinal laser photocoagulation on visual acuity, visual fields and on subjective visual impairment in preproliferative and early proliferative diabetic retinopathy. Acta Ophthalmol (Copenh). 1994 Oct. 72(5):570-5. [Medline].